Ample poster area for poster exhibitions. Individual panels (90cm x 90cm) will be provided. A dedicated room with wireless internet link for the conference participants. General wireless access from the lecture halls. Overhead and multimedia projectors and computer display facilities for your laptop. Morning and afternoon coffee-breaks with impressive views of the island's northern coast. Address: Hotel Semiramis, Calle Leopoldo Cologan Zulueta, 12, 38400 - Puerto de la Cruz (Tenerife), Phone: +34 922 373 200, Fax: +34 922 373 193. 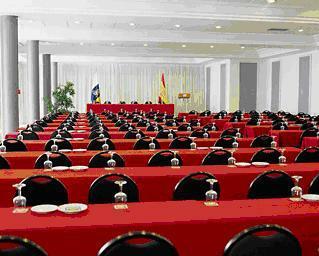 The Hotel Semiramis is located on the sea front, in a quiet and pretty area of Puerto de la Cruz. It offers unbeatable views of the sea and the northern coast of Tenerife. The town centre is about 2 km away. The Lago Martianez saltwater pools and beach are some 1.5 km away. All the rooms are double rooms with 2 queen-size beds, air conditioning, an en suite bathroom and a terrace with sea or mountain views. There are rooms for customers with disabilities. In the 2,000 m² of sub-tropical gardens, guests are offered an open-air pool and a heated thermal pool. In addition, there is a poolside snack bar and a sun terrace. A spa and a gym are also available, as well as table tennis and billiards. Some of these services have an extra charge.